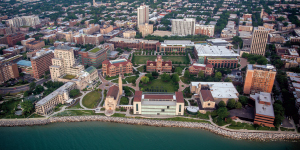 Loyola University Chicago is located in CHICAGO, ILLINOIS-—the third-largest city in the United States. A hub of commerce and culture, Chicago serves as an expanded campus for Loyola students, who have direct access to the city’s countless career, internship, service, recreational, and entertainment opportunities. Geographic Diversity: Students come from 44 states and 57 foreign countries. 42% of the student population identifies themselves as African American, Asian American, Latin American, Native American, and multiracial or other. International Student Services: The Office for International Programs (OIP) coordinates study abroad opportunities for Loyola students and offers services to visiting international students and scholars. The OIP also operates the Chicago office for the John Felice Rome Center and provides ESL services to the Loyola community. Financial Aid: Merit-based scholarships are available for freshmen and transfers, including international students. Visit luc.edu/finaid for more information. Test Score Requirements: Incoming freshmen are required to take either the ACT or SAT. International students may be required to take the TOEFL or IELTS. Ranked a top 100 university byU.S. News & World Report, LoyolaUniversity Chicago continues to advance the 450-year-old Jesuit tradition of rigorous academic study grounded in the liberal arts. We empower you to develop your knowledge andskills, find your purpose, shape your identity, and make a difference in yourcommunity. Loyola’s transformative education will help you develop asa whole person—intellectually and spiritually. Loyola students can take advantage of many academic opportunities inChicago. • 525+ employers have hired Loyola students for academic internships. • Research and field work opportunities are available at many major local institutions. • The population of the Chicago metropolitan area is 2,736,100, withover 200 neighborhoods representing cultures from around the globe. • Chicago is home to 70 museums, 200 theaters, 6,500 restaurants, and 26 miles of public beaches. Rome Start gives select students the opportunity to spend the first year oftheir Loyola experience studying at our campus in Rome, Italy. 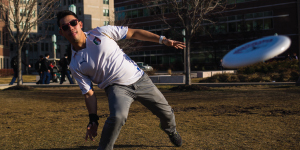 After their first year in Rome, students complete their degree at our main campusin Chicago. 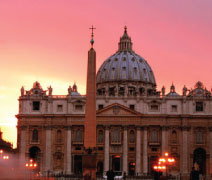 This unique program allows students to gain a global perspective through their education while receiving a renowned Loyola degree.To learn more about Rome Start, visit luc.edu/romestart.